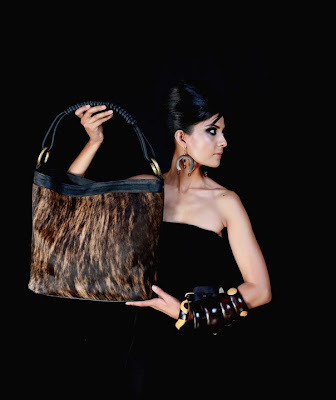 For one night only, one-of-a-kind accessories created by Kenya-based designer, Adèle Dejak, will be on sale in London. Her bold, contemporary, African-inspired jewellery, bags and belts are ideal for that unique Christmas gift or treat. Dejak uses a variety of materials including reclaimed and upcycled metal, glass, cement bags and rice sacks; as well as a variety of African textiles and age-old craft techniques. The event will take place at The Drift Bar from 6pm on Tuesday 8th November, 2011. For an opportunity to win one of Adèle’s creations, RSVP at "mail to: info@thedriftbar.co.uk with ‘Dejak Giveaway’ in the subject of the email and you will be entered into a draw (contestants must be present at the sale to win). The Drift Bar is located at the Heron Tower, 110 Bishopsgate, London EC2N 4AY. Born in Kano, Nigeria and brought up in Cambridge England, Adèle developed her multiple artistic interests in the UK and Italy, where she established her studio in Rome and worked as the Art Director of the best-selling Italian Pop Magazine. Adèle Dejak is a brand-new dynamic brand that creates simple cutting edge fashion accessories for the modern woman looking for a sophisticated but hip outfit! It is a brand that has its roots in the heart of Kenya. Here, stunning cutting- edge contemporary designs are created for all those stylish women looking for unique, contemporary accessories. The Drift Bar is "an island of calm in the heart of the city". The venue boasts striking bars, inventive cocktails and imaginative culinary creations bursting with flavour and colour.